Training has two objectives: (1) to condition your body for fighting, and (2) to improve your workmanship as a fighter. Although some exercises help condition and others speed improvement, there's one all-important activity that assists both. That activity is sparring. THERE IS NO SUBSTITUTE FOR SPARRING. You must spar regularly and often to become a well-rounded scrapper, regardless of what other exercises you may take. Sparring not only improves your skill, but it also conditions your body for fighting by forcing your muscles to become accustomed to the violent, broken movements that distinguish fighting from any other activity. Much has been written about rhythm in fighting. Nearly every scrapper develops some rhythm to his movements in footwork, bobbing, weaving, etc. And some fancy Dans appear to have almost as much rhythm as a ballet dancer when they shadow-box. But when the chips are down, rhythm is destroyed. Your opponent's feints, leads, counters and defensive moves will break your rhythm in a hurry and will force your movements, on attack or defense, to be necessities of the split-second-to be violent and broken. Because the movements in fighting are violent and broken, fighting is perhaps the most tiring of all human activities. Some college experts insist that rowing on a crew is more exhausting than boxing. I don't know about that. I never rowed on a crew. But I do know that crewmen have a rhythm or "beat," to which they time their strokes. A fellow may be a perfectly conditioned athlete for some other activity-like basketball, football, baseball, rodeo, riding, acrobatics, hurdling, wrestling, etc.-but if he hasn't had sparring practice, he will be completely exhausted by two or three minutes of fast fighting. His muscles will be unaccustomed to the movements, and he will be unaccustomed to breathing while making those movements and while being hit. For a beginner, at least, Sparring is the most important conditioning activity. Sparring also is the most important "sharpening" activity. It perfects your timing and judgment of distance in punching against a live and elusive target. It makes you adroit on defense and alert in countering. It grooms you to make exactly the right combination of moves in a split-second-instinctively. Shadow-boxing is the next best exercise for the twofold purpose of conditioning and sharpening. It might be described as fighting an imaginary opponent. It is particularly helpful in developing footwork. Although most professional fighters do not use boxing gloves during their shadow work, beginners should use them. Their weight will help to develop stamina. As you shadow-box, go through the same offensive and defensive movements you use in sparring. To be most valuable, your imaginary fighting should be done at top speed. Too many scrappers loaf at this work. Bag-punching is another exercise that conditions and sharpens. At every practice session you should work three rounds on the light, inflated bag, and two rounds on the heavy "dummy" bag. Speaking of rounds, I advise that in your early training-sparring, shadow-boxing, bag-punching etc.-you limit each round to two minutes. Rest one minute between rounds. Later you can extend each round to three minutes, the same time used in rounds in professional fights and for rounds by professionals in gymnasiums. However; continue to limit each rest period to one minute. Work on the bags will develop all the muscles you use in punching, and it will give "tone" to them. Your chest, shoulders and arms will take on that sleek, well-rounded appearance that distinguishes the bodies of most fighters from those of ordinary chaps. Work on the light bag is more important than that on the heavy bag; for the light bag is a speedy target that sharpens your timing and judgment of distance, as it conditions your muscles. 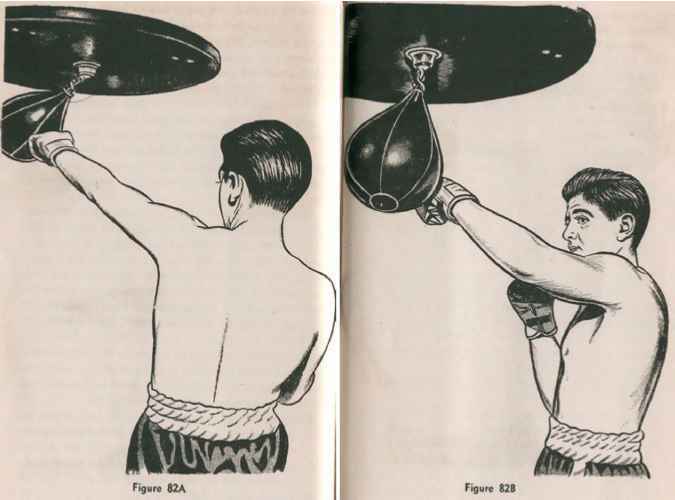 Before each session of light-bag punching, you should make certain that the bag is about chin-high and that it's firmly attached to its topboard. If it becomes unscrewed from the topboard while you're punching, you may get struck in the face by the metal attachment. If your bag is too low, the topboard will be too low; and you may strike the board with your fist if you miss a punch. On some punching-bag standards, the board can be lowered or raised. 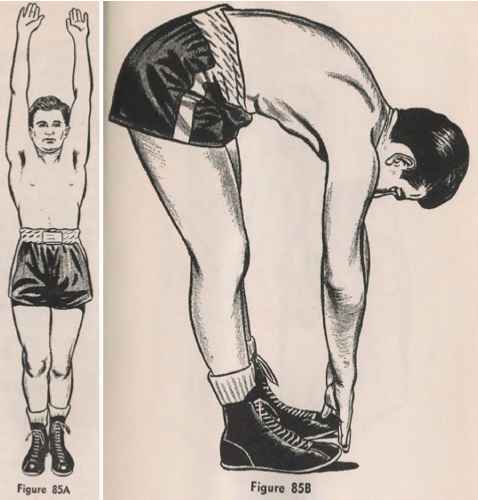 However, if the board is stationary, the gymnasium proprietor usually provides a small, wooden platform, five or six inches high, on which a short chap can stand and be in proper position to hit the bag. Devote one minute of each round on the light bag to the straight-and-backhand tattoo. You do that tattoo in your normal punching position without moving the feet. The tattoo goes like this: straight left - backhanded left - straight right - backhanded right - straight left - backhanded left, etc. (Figure 82 A and B). That exercise not only develops your muscles and timing for punching from the whirl, but it also gives you a powerful blocking or slicing backhand. During the other minute (or two minutes) of each round, you should practice all your head blows-stepping straights, fast medium-range exchanges, shovels, cork-screws, tight outside hooks, and uppercuts. Be careful not to strike the topboard with your uppercuts. Hit the bag hard. Don't get the habit of using light stuff, even on the bag. The heavy bag serves two purposes: (1) It accustoms you to landing solidly with every type of punch to head or body, and (2) it provides a body target that's lacking in light-bag work. Practice all your punches on the dummy, and use the proper footwork when you do. Spend about one minute of every round in sharpening your bob-weave attack. 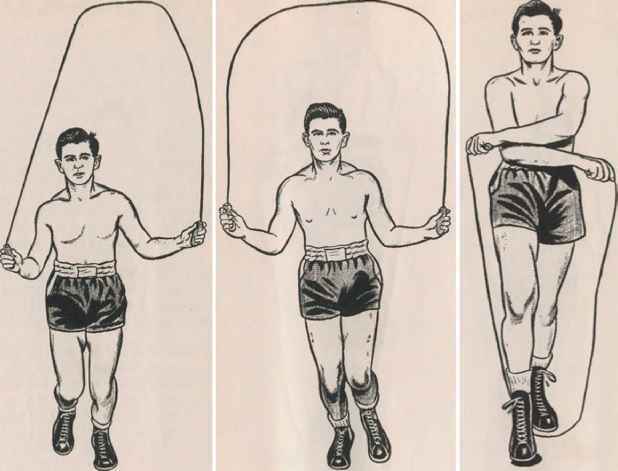 Slide in with corkscrews to the body; then barrage the body terrifically with hooks; next, lift the barrage to the head. The next time you slide in, try a mixed barrage in which one fist smashes the body and the other the head; then the head-fist to the body and the other to the head, etc. Practice combination series after you slide in. Use your own striking gloves on both bags. If you use some other fellow's gloves and skin your knuckles, you may get your hands infected. Put camphor ice on your skinned knuckles before you go to bed. In a few weeks your knuckles will become calloused, and you'll have no more trouble with them. GOOD EXERCISES FOR CONDITIONING THE BODY ARE ROADWORK, ROPE-SKIPPING, AND CALISTHENICS. ROADWORK means running on the road. Running strengthens the legs and develops stamina. It also takes off weight if you wear warm, heavy garments while running. Regardless of other apparel, you must wear shoes that have sturdy soles and tops that come up over your ankles. Also, you should wear heavy socks to prevent your feet from becoming blistered. If you are soft and poorly conditioned when you begin training, you should harden yourself by hiking over rough ground for at least two weeks before attempting any running. When you do begin to run, take it easy at first. Limit yourself to dog-trot jogs of about a half-mile each morning for seven days. Then, gradually increase the distance until you are jogging about two miles. After you've become accustomed to roadwork and your feet have hardened, mix up your runs by sprinting for 100 yards, then jogging, then shadow-boxing for a few seconds, then jogging, then sprinting, etc. Nearly all professional fighters do their roadwork early in the morning. Do yours whenever you get the chance. Naturally, you'll take a shower when you come in from your spin. Professionals do from three to ten miles on the road. ROPE-SKIPPING develops stamina, coordination and leg-spring. At a sports-goods store you can buy a skipping rope (not one of those toy ropes that kids use). Or, you can make a rope by soaking a piece of clothesline overnight in a can of light lubricating oil. Hang up the rope and let it dry out for a day. Then, fold the ends of the rope back and tape them into "handles" with bicycle tape. The skipping rope should be fairly heavy but not too thick. That's why you give it the oil treatment. In skipping, you do not jump with both feet at the same time; nor do you skip with a hippity-hop, like a school girl. Instead, you bounce off one foot and then off the other (Figure 83A and B). That will seem awkward at first; but soon you'll be skipping with an effortless grace that will surprise you and your friends. To make skipping interesting, you can learn to do it backward. You can learn to cross the rope forward (Figure 83C) and backward, and to make the rope go around you twice while you are in the air once. You'll have a lot of fun with the rope. You'll be able to do footwork while skipping, and perhaps you'll even be able to dance a jig while the rope is whirling about you. Naturally, the skipping is done in a gymnasium or in whatever you are using for a gym. Do at least two rounds of skipping at each workout. 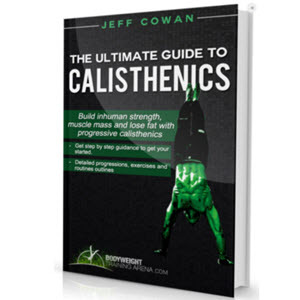 CALISTHENICS for a fighter are exercises designed chiefly to build up protective muscles in his stomach and neck, and to make him supple. A fighter should avoid heavy exercises like weight-lifting, for they tend to make him muscle-bound. The best bending exercise is done while lying on your back on a reasonably soft surface such as a mat or several thicknesses of towels. Lie stretched out flat with your feet together and your arms extended back of your head (Figure 84A and B). Bend forward slowly, bringing your hands up in an arc, and touch your toes with your hands. 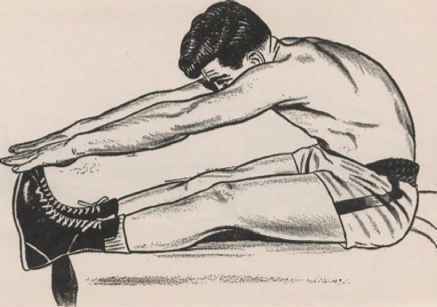 Then return slowly to your original stretched-out position. If your feet rise when you bend forward, have someone hold them down. Repeat the bending until you are tired. At first, you'll tire quickly; but in a few weeks you'll be able to do 25 to 30 bends; later, 50 to 100. You can break the bending monotony by spreading your legs and touching the left toes with your right hand; and on the next bend, your right toes with your left hand, etc. Also, you can lock your hands behind your neck and, in that position, bend forward until your chin goes between your knees. Keeping your hands in that position, touch your left knee with your right elbow on one bend, and your right knee with the left elbow on the next one, etc. Be certain you do those bends on a soft surface so that you cannot injure the vertebrae of your lower spine. Neck muscles should be strong to absorb the shock of head punches. 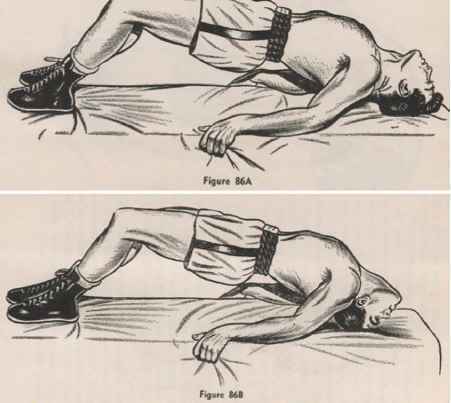 The best exercise for strengthening the neck muscles is the "bridge" (Figure 86A and B). Lie on your back on the mat. Lock your hands on your chest. Make a simple bridge by raising your body until it is supported by your feet and your head. Still in the simple bridge, roll back on your head until your forehead is touching the mat. Then return to the simple bridge, and then to your stretched-out position. Repeat the procedure several times. You can also strengthen the neck muscles while you are standing. Turn the head from side to side, and on each turn stick out the chin as far as possible toward a shoulder. There are many other exercises you can learn around the gymnasium that you can use if you decide to go into amateur or professional competition. But those I've given you are plenty to help you become a well-rounded scrapper. For example, you can develop strength in your arms and shoulders by using wall pulleys, and by doing "push-ups" from the floor. Some trainers do not approve of the pulleys or the push-ups. They believe those forms of exercise tend to make you muscle-bound. I approve of them, unless you already are heavily muscled in the shoulders and arms. You can strengthen your hands outside the gymnasium by carrying with you a rubber handball and squeezing the ball for a couple of hours each day, first in one hand and then in the other. I advise that, if your hands are fragile; for strong durable hands are very important in fighting. Strong hands help your explosions and also help prevent bone-breaks. Some trainers harden the stomach muscles of their fighters by throwing a medicine ball at their stomachs. The fighter stands with his arms relaxed, and lets the ball hit him squarely in the body. He catches the ball as it bounces off his stomach, and returns it to the trainer for another throw. That's a good hardening procedure for a fellow who's already had two or three years of training. But I wouldn't advise it for the average beginner. You might injure yourself internally. Every boxer-beginner or seasoned professional-must have a gymnasium schedule and a general schedule for the day, and he does best when he sticks to those schedules. Take a one-minute rest between rounds. Having finished your workout, you take a five-minute "sweat-out" by sitting relaxed or by lying down in the dressing room. In either case, you are warmly wrapped in your bathrobe or in a sheet. Make certain you are not in a draft. After the sweat-out, take a quick, lukewarm shower. If the workouts make your muscles stiff and sore, you should take a rub-down after the shower. Most professionals take a rub after each workout, as insurance against soreness and to keep their muscles supple. The "rubber" (rub-down man) applies soothing lotions to the muscles as he kneads them with his fingers. You doubtless will not have the services of a rubber while you are learning to fight. However, you might arrange for your sparring pal to rub you down in return for your rubbing him. You lie on your back on a rubbing table or on towels on the floor and let him work on the front muscles of shoulders, arms and stomach; then, turn over and let him knead the rear muscles of shoulders, arms and legs. If you can't make an arrangement like that, you can apply rubbing lotion to your own muscles after each session -if you need such treatment. Omega Oil, which you can buy at any drugstore, is an excellent lotion. Or, you might make your own rubbing preparation by mixing the following: 3 ounces of rubbing alcohol, 3 ounces of witch hazel, 1 ounce of wintergreen, and 1 ounce of olive oil. If you have engaged in a particularly violent sparring session or in a bruising fight, you can prevent soreness in muscles and bruises by taking an Epsom salts bath at home. Fill a bathtub nearly to the top with very warm water, and pour in five pounds of Epsom salts. Lie in the tub half an hour. Then go to bed. All professionals do their gym work in the afternoon; but most amateurs have to do theirs at night, because most amateurs have jobs in the daytime. High school and college boys are exceptions, of course. They usually can do their gym work in the late afternoon. Regardless of when you go to the gymnasium, and regardless of whether you're an amateur or a professional, you should do your roadwork early in the morning. Rise. Drink a cup of hot tea, or a cup of beef broth or chicken broth. Arrive home. Take brief sweat-out and shower. Have breakfast of fruit juice, cereal, eggs, and milk or tea. Lunch of lettuce and tomato on toast (perhaps with two or three slices of bacon). Glass of milk or cup of tea. If you do not have bacon with the lettuce-tomato sandwich, you can drink a malted milk. Gymnasium. Have cup of hot tea with lemon before the workout. Home and dinner: half grapefruit or glass of fruit juice or cup of broth. A salad with olive oil and perhaps lemon juice. No vinegar! Meat -anything broiled or boiled; nothing fried. Steaks, chops or chicken. Stews are good if you need to gain weight. Also, a baked potato, if you need weight. But no pork, veal, lobster, shrimp, crabmeat, or starchy foods like spaghetti. For dessert: stewed fruit, prunes, apricots, pears, or rhubarb, etc. Also hot tea. No pastries. The amateur's diet is about the same as that of a professional; but the pro's schedule is much easier from the angle of time. The pro is on the road at 5:30 A.M. Returning to camp, he can rest until 10 A.M., when he has breakfast. Then he loafs until noon, when he can have lunch or a nap, depending upon his weight. He begins his gym work at 2:30 P.M. Then he relaxes until dinner at 5 P.M. or 5:30 P.M. After that more loafing or a movie until 10 P.M., when he goes to bed. An amateur who is training and working on a job, at the same time, must make sure that he gets eight or nine hours' sleep every night. Otherwise he may go "stale." He may become listless-"dopey"-on his job, and off-form in his sparring. 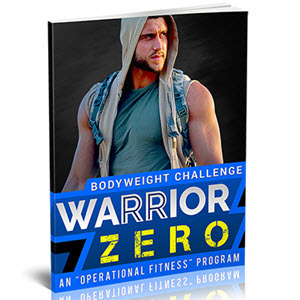 He burns up much energy every day, on the job and on the road and in the gym. He must get more than eight hours of sleep in twenty-four to restore his energy. And he should sleep with his windows open. He can't get oxygen- he can't recharge his batteries-by sleeping in a closed room. I neither smoked nor drank before I became champion. I would not preach to others that they likewise should refrain from tobacco and alcohol. However, I believe that my avoidance of smoking and drinking gave me that extra bit of stamina which enabled me to win several hard fights by the narrowest of margins. If you are in an area where no trainer or instructor is available, I suggest that when you go to your doctor for a physical check-up, before attempting to spar, you also have the physician decide whether your weight corresponds properly to your height, bone structure, and age. Don't let any of your friends tell you, for example, "You should weigh about 155 pounds because you are five feet, ten inches tall." Your weight depends considerably upon your bone structure. You might stand only five feet seven, yet properly weigh 200 pounds, if you were big-boned and broad-shouldered-husky but squat. 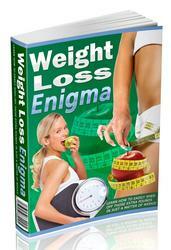 You could be a six-footer, yet properly weigh 165 pounds or even less if you were slender and small-boned. Moreover, if you happen to be a youngster in the fast-sprouting state, you could be skinny and all bones and joints, but still be normal. Your weight is very important. If you're too soft and flabby, you should pare off some poundage by exercise and proper diet, so that your body will be firm for fighting. And if you're too skinny, exercise and wholesome food will help build you up. Find out from your doctor about how many pounds you should take off to be at your "best weight," or how many you should put on. Though you resemble a circus fat man or a human skeleton, you'll be able to fight surprisingly well if you practice the fundamentals of explosive fighting I've explained in this book. You'll be able to stiffen many a fellow with one punch, or with a couple of punches. But remember this: You'll be able to fight better if you make your weight conform to your height and bone structure. Excess fat will slow you up and make you get winded in a hurry. 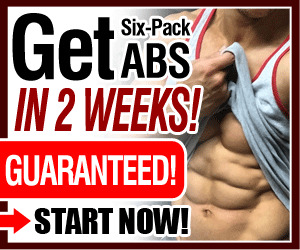 Also, it will prevent your developing protective stomach muscles. On the other hand, if you're skinny and undernourished, you will not be able to hit as explosively as if you had your normal weight. Punches to the body will weaken you more than they should, and you will tire more quickly than you should. WEIGHT IS ULTRA-IMPORTANT IN FIGHTING. Get your right weight; make the proper use of it; and you'll have happy, explosive landings.